The best fleets in the business are the ones that are the most effectively managed—which is why a great fleet manager is worth his weight in gold. But what makes a great fleet manager great? Ultimately, it’s a solid fleet management strategy that drives a fleet business, and helps them find short-term and long-term success. 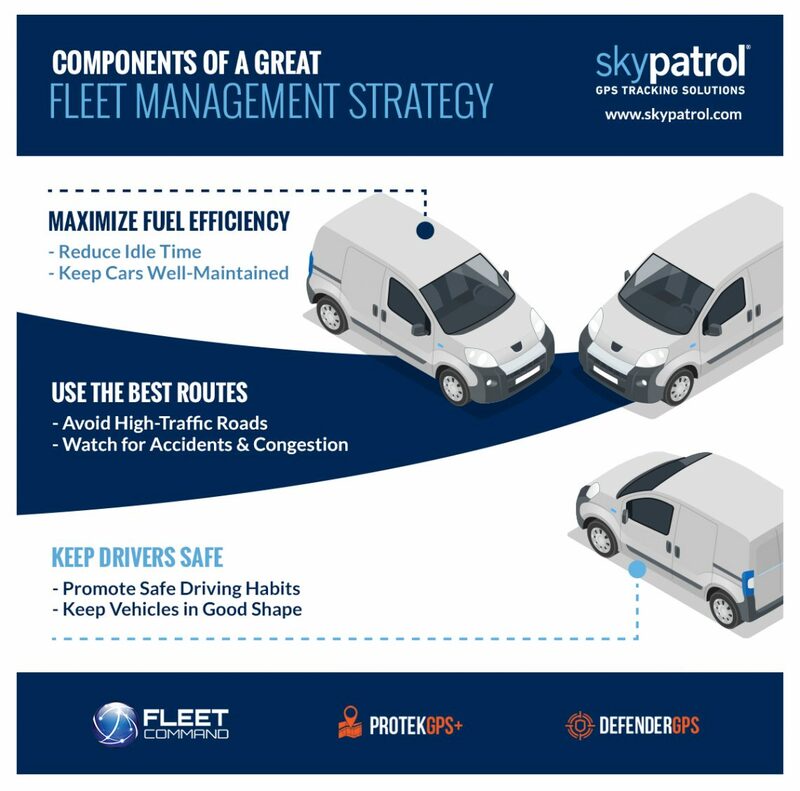 In this blog, the fleet management software team at Skypatrol will give you tips for creating a solid fleet management strategy. With some hard work and the right plan, you’ll see fleet growth, increased profits, and a happier, more productive team! Your vehicles are the glue that holds your business together—without them, well, you wouldn’t have a business at all. While it’s important to purchase good vehicles, it’s also good to know your vehicles. How do they behave on certain roads and in certain weather conditions? How often do they need oil changes and routine maintenance? Do they rip through tires pretty quickly, or need new spark plugs at 30,000 miles? These are questions you need to ask, and things you should be aware of when it comes to your fleet vehicles. If you’re unaware of these vehicle issues, you’re going to encounter problems when it comes to the functionality of your vehicle. A prolonged or neglected repair could lead to more expensive fixes in the future, and a missed oil change could lead to a breakdown that throws your entire fleet business off schedule for days or even weeks if your repair shop is also behind schedule. The more you know about your vehicles, the more likely you are to keep them in working order. Learn as much as you can, and ensure the success of your fleet vehicles for many miles to come. Create a vehicle replacement schedule. As much as you might love your fleet vehicles, they’re not going to last forever. Day after day, your vehicles will put on the miles, take a beating, and eventually deteriorate and be subject to frequent breakdowns. It’s just part of the fleet business. It might be tough for you to fork over money every few years for new fleet vehicles, but the financial alternative is much more expensive. If you fail to replace your fleet vehicles within a reasonable amount of time, you’ll spend a hefty price on repairs, slow down your delivery schedule because of less vehicles in service, and ultimately, do damage to your expense report and your profits. Buying new fleet vehicles costs a lot of front, but it gives you peace of mind and ensures that you’ll always have enough vehicles in service to maximize your profits. Your drivers won’t mind the new wheels either, which makes for happier drivers as well as customers. Have an understanding of fuel costs. Fuel is one of the largest recurring expenses fleet businesses deal with—and one of the most unpredictable expenses at that. Every little bit of extra fuel consumption adds up over time—if you have 20 drivers that all spend two hours idling their vehicles every single month, it’s going to hurt your bottom line. Even things like inclement weather, oil changes, road work, and driver behaviors can play a huge part in your fuel consumption month over month. To improve your fuel consumption and slash your expenses, you need to have an understanding of how your vehicles are being used. That’s where GPS-based fleet management software comes in handy. By monitoring driver routes and behaviors, as well as idle time and fuel efficiency over time, you’ll be able to better educate your drivers and make proactive decisions that can cut your fuel costs and improve your fleet’s efficiency. Know which streets to avoid. Traffic is one of the greatest enemies of fleet managers and drivers—all it takes is a little congestion or a fender bender to delay deliveries and throw the entire fleet off schedule. However, there are some streets that are destined to have bumper-to-bumper traffic and congestion during certain parts of the day, and those streets should be avoided at all costs. The best fleet managers take advantage of real-time traffic info and GPS technology to ensure the most efficient routes. But more importantly, the best fleet managers listen to their drivers. Drivers have the best understanding of the road system in their city, they’ve done their time sitting in stop-and-go traffic, and they’re the ones who get most of the flack for late deliveries. Their knowledge of what affects fleet efficiency is huge for your business, so keep your ears open when your drivers are talking about ways to make more deliveries and streets that should be avoided. Your drivers have the best understanding of the roads and routes, and your finance department has the best understanding of your company’s finances. But it’s important that these departments have an understanding of each other as well. If your fleet manager understands how drivers work best, he can plan routes accordingly for increased driver satisfaction and fleet efficiency. If your manager understands the operations of the finance department and their short- and long-term goals, he can use that information to make proactive fleet management decisions that align with those goals. With a better understanding of the big picture of a fleet company, employees in all departments can make better decisions that help each other and improve the business, its operations, and its profits. Even the most focused and experienced fleet managers will have trouble staying organized and productive without a proper fleet management system in place—and while some fleet managers might have an elaborate system of spreadsheets and file cabinets to run their business, there are much easier ways to improve your fleet and run your business smoothly. That’s where Skypatrol’s Fleet Command can help. Our state-of-the-art fleet management software allows fleet managers to keep track of vehicle and driver efficiency, the best routes, and maintenance schedules so they can maximize the potential of their business. 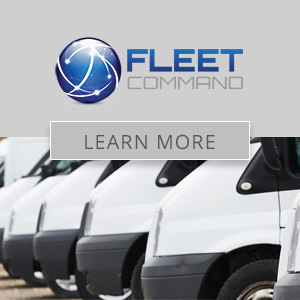 Don’t wait—schedule a demo of Fleet Command today.